Doctor Who's first female Time Lord will be joined by three new regular cast members, the BBC has announced. 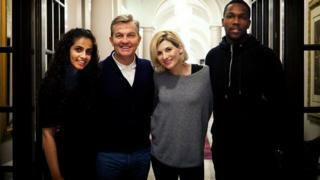 Jodie Whittaker, who takes over as the 13th Doctor next year, will be joined by Bradley Walsh, Tosin Cole and Mandip Gill, as well as Sharon D Clarke in a returning role. Walsh will star as Graham, Cole will play Ryan and Gill will play Yasmin. Walsh said he was looking forward to being part of the show - some 50 years after first becoming a fan. This is just another interesting career move for the man with one of the most varied CVs in showbusiness. He started out as a professional footballer for Brentford FC and launched a music career last year - notching up the biggest-selling debut album of 2016 by a British artist. This isn't his first experience of the world of Doctor Who - Walsh says he's watched the show for 50 years and even briefly appeared as a villain in spin-off show Sarah Jane Adventures in 2008. He said: "I remember watching William Hartnell as the first Doctor. Black and white made it very scary for a youngster like myself." Gill, who has worked in film, theatre, radio and television, got her first major TV role in 2012 when she was cast as Phoebe McQueen in Hollyoaks. She was on the soap for three years before her character was killed by an infamous murderer. She has also popped up in Doctors, Cuckoo and Casualty. And she will soon be seen in Kay Mellor's new BBC drama Love, Lies and Records. Gill said she was "over the moon" to join the "iconic" Doctor Who, adding: "Certain roles seem unattainable and this is one of those, so much so I didn't believe it to be true for the first few weeks." Cole is no stranger to the world of sci-fi as he's already appeared in Star Wars: The Force Awakens with a speaking role as a member of the Red Squadron. He will now join the elite group of Warwick Davis, Dave Prowse and Felicity Jones who have starred in both Doctor Who and Star Wars. Cole has also had roles in EastEnders spin-off E20 and Hollyoaks, so has already worked with Mandip Gill. "I'm grateful and excited to be a part of this journey with the team," Cole said of his casting. "I'm looking forward to jumping in this Doctor Who universe." Chris Chibnall, the show's new head writer, described the trio as "three of Britain's brightest talents". He added: "The new Doctor is going to need new friends." The BBC also confirmed the series will have a 10-week run of 50-minute episodes in autumn 2018, starting with a special hour-long show for the launch. No details about the new characters beyond their names have yet been revealed. Whittaker was revealed as the next Time Lord in July. The Broadchurch star succeeds Peter Capaldi, who took over the role in 2013 and leaves in the forthcoming Christmas special. 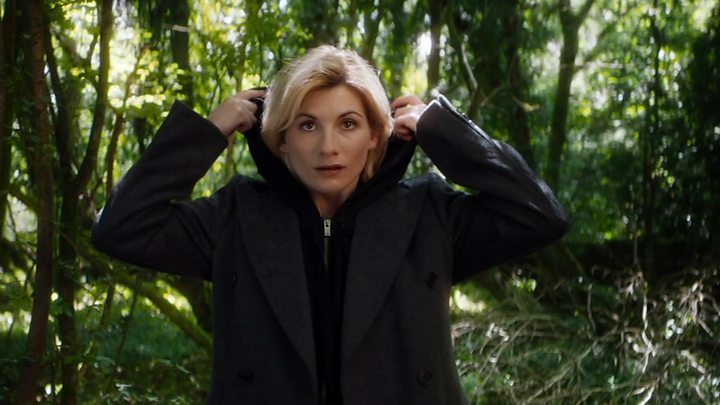 The reaction to Whittaker's casting was mostly positive - but some fans protested that the Doctor shouldn't be played by a woman. The appointment also sparked a war of words between two former Doctors. Peter Davison, who played the character from 1981 to 1984, said he felt "a bit sad" that the character might no longer be "a role model for boys", but his comments were dubbed "rubbish" by his successor Colin Baker.